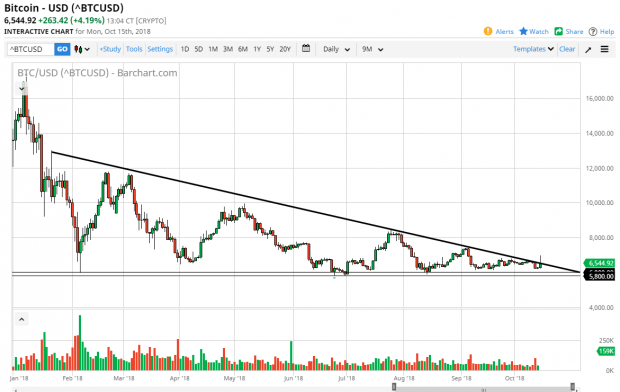 Bitcoin had an interesting session on Monday, initially spiking higher and breaking above the downtrend line that we have seen on the chart for so long. That was a very good turn of events for technical standpoint and was backed by fundamental news in the sense that Fidelity investments is putting together a platform for institutional trading of cryptocurrency. This is one of the things that people wept looking for, Wall Street getting involved in the cryptocurrency market, which is interesting considering it goes against everything that cryptocurrency was started for. However, looking at the chart, we have given back quite a bit of the spike during the day, and it now looks as if we are settling back towards the downward trend line. It is because of this that I’m not as bullish as I should be, because quite frankly I would have loved to have seen the market close above the downtrend line, and closer to the top of the candle. This looks suspiciously like a false breakout, but I still believe that if we can break above the top of the candle stick for the day on Monday, then that’s a very strong sign. Many people will be concerned because the top of the candle stick is roughly $500 above where Bitcoin is trading as I record this. However, if we do break out to the top part of this candlestick and clear the resistance, the market probably has quite some distance to go and $500 wouldn’t be very important. 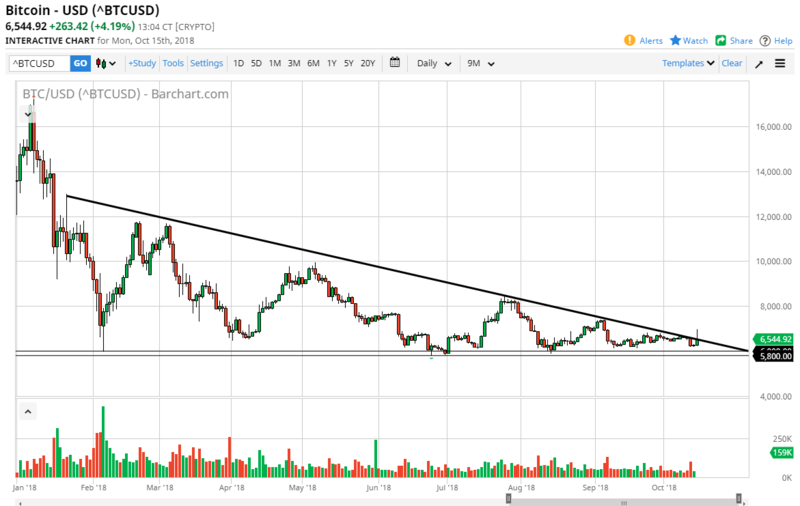 Beyond that, we do have the support underneath, as the $6000 level continues to be the “line in the sand” that a lot of people are defending. At this point, I think the market still looks likely to go sideways.